A Librarian's Lists & Letters: List #154: Let's Go Bucs! List #154: Let's Go Bucs! This isn't a baseball post. I won't pretend to know anything more than the basics of the sport. And this isn't a bandwagon "I Love the Pirates" post either. I'm a born and raised Pittsburgh gal. I went Three Rivers when I was young and I go to PNC now. 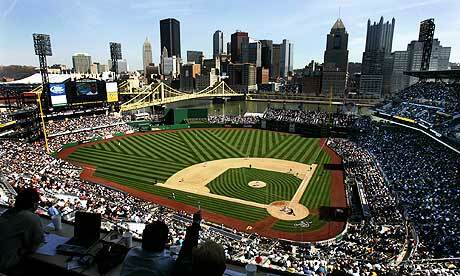 The Pirates will always be my favorite team, because they will always be my home team. No, instead this post is just about a girl meets summer, likes to go to ballgames, loves that it brings friends closer together, and always picks the winner at the pierogi race. It's a post about a girl who bought tickets three weeks ago, for a boy and his favorite visiting team team. And how that girl and that boy broke it off before the actual game. And it's also about how the girl paid for them since he wasn't near a computer and she never printed them. And how lucky she is that she has a girl friend who loves baseball. It's about enjoying summer. And looking forward to two baseball games this week. And I'm willing to bet, two different pieorgi race winners. This is PNC Park. Everyone knows that it's the best park. And everyone is right. And it's about how the Pirates have always given the city of Pittsburgh something to cheer about during the dog days of summer. Even when they are doing terribly. Because Pittsburgh is loyal.